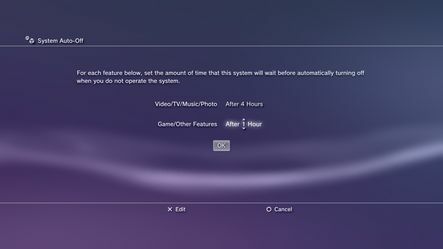 Under Settings > [Power Save Settings] > [System Auto-Off], you can now set the amount of time until the system automatically turns off for [Video/TV/Music/Photo] and for [Game/Other Features]. Under [Date and Time Settings] > [Time Zone], [Samoa Islands] has been changed to [American Samoa] and [Independent State of Samoa]. 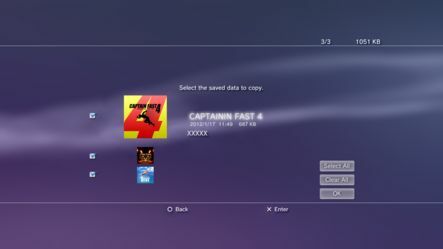 Under Games > [Saved Data Utility (PS3™)], you can now select multiple saved data items, and then either delete or copy them as a group. When the wireless stereo headset (CECHYA-0080) is connected, you can now adjust the sidetone level for microphone audio. Select [Sidetone] under Settings > [Accessory Settings] > [Audio Device Settings]. In addition, if you use the Wireless Stereo Headset to watch Blu‐ray Disc or DVD movies on your PS3 system, this system software update will also enable virtual surround sound functionality giving you a superior audio experience. The encryption key has been renewed for AACS, the copy protection system for Blu-ray Disc video content. If you see a message regarding encryption key renewal during playback of commercially available BD video software (BD-ROM), update the system software to the latest version. The encryption key will then be automatically renewed.